You've seen our beautiful feathered angel wings everywhere! They've been featured in the movies; on T.V. (The ABC series Teen Angel and L'eggs commercials); plus numerous recent magazine layouts. Put the pictures in here at this point, then continue with the rest of the test after the pictures. Please see the images in 50megs under WingsInMedia to make sure you have all of the iamges. Now we are happy to bring our wings to you on this our new home on the web! You've watched angels dance, listened to songs and read about angels. You've been touched by an angel, encountered the angst of the teen angel, and watched the web fill up with angels. Now you can purchase your very own wings and be an angel! 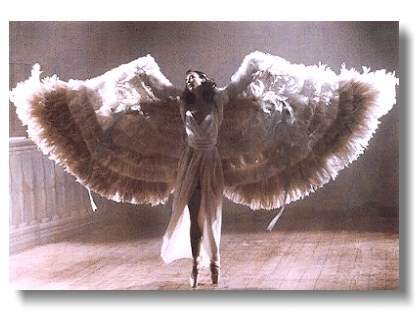 You won't get airborne, but you will look absolutely fabulously angelic.